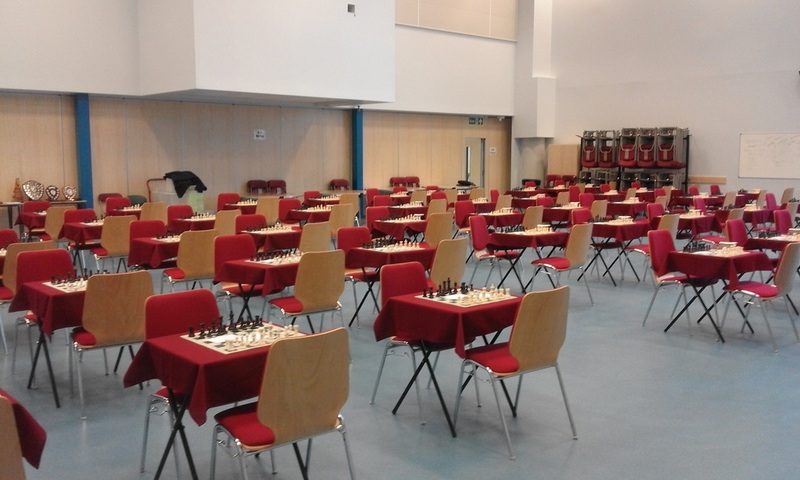 The Northern Gigafinal is the event for qualified Northants players to attempt to reach the Terafinal, the final stage each year of the UK Chess Challenge. This took place over the weekend of 9th/10th July - the younger sections took place on the Saturyday and the older sections on the Sunday. There were many players participating from Northants and the immediate surrounding counties, and well done to all those who took part. Luca Gillespie, Zak Gillespie, Milly Kotecha, Vignesh Sudhakar, Emily Rowe, and Bryony Tomkins. Sarthak Sanyal, Lucian Cox, Alexander Dytrych, Tom Bracey, Krishna Srinivasan, Rudra Bhimpuria, Ben Cox, and David Collyer. The rearranged NSCA AGM will now take place on July 19th at the Overstone Manor in Sywell near Northampton. Everybody is welcome to attend, or if you would like an issue raised at the meeting please feel free to contact us via the relevant page here. All the final scores for both SSAFA 2016 and this season's NSCA Grand Prix have now been updated on the relevant pages - you can see the SSAFA scores here, and the Grand Prix scores here. This year's SSAFA tournament took place for the second year running at Our Lady's Primary School in Wellingborough. There was a good turn out, including as often is the case some players from over the borders in Leicestershire and Bedfordshire, but also this time around some players came from Cambridgeshire - it is great to have players travelling from our neighbouring counties, and you are all always very welcome at our tournaments. All the scores from all the sections will be available shortly, but meanwhile photographs of some of the winners can be viewed here. This event marked the end of our season, and with it the end of the 2015/2016 NSCA Grand Prix. Many of the sections were extremely close affairs, and all the final scores for these will also be available shortly, but some of those winners can now be viewed here. This year's SSAFA Tournament, the last local Junior tournament of the season, and also of the current NSCA Grand Prix, takes place on Saturday 18th June at Our Lady's Catholic Primary School in Wellingborough. An entry form can be downloaded here. This is a team as well as an individual tournament, and with most sections of this season's Grand Prix being extremely tight scoring there is much to play for this year - we look forward to hopefully seeing many of you there. As part of the UK Chess Challenge, this year's Rockingham Megafinal took place at the new venue of Wellingborough School, and players from Northants, Leicestershire and Rutland gathered in their attempts to qualify for the Northern Gigafinal in Manchester. Congratulations to all the Supremos, Supremas, and those scoring sufficient to succeed in the qualification process, and the scores from all the sections can be found here. A total of 17 counties gathered in Nottingham for this year's EPSCA Under 9 Team Final, including the county team from Northants. It was always going to be tough going, but all the players gave their best, with the team accumulating a total of 13 points to place Northants joint 14th, but only 1.5 points off of a top 10 placing. Indeed the scores were very close throughout, apart from the very top teams, with Kent finally coming out champions with a mighty 33 points from a possible 36, with Barnet finishing second. Notable performances within the Northants team were Alexander Dytrych, who scored a maximum three out of three on board 6, and Anirudh Kandikattu with a score of two on board 9. All the final scores for all the teams can be viewed on the following link here. The Northants girls team made the long trek upto Cheadle Hulme near Manchester to play in this years EPSCA Under 11 Girls Final. It was a very tough competition, but all the players gave their all, with the top scoring member of the team the captain Milly Kotecha, who finished the day unbeaten with two wins and a draw. Sadly though with such strong opposition in attendance the team finished on a total of 8 points, with Barnet taking the title, four points clear of Nottingham. All the final scores of the players and the teams can be found ﻿here﻿. Next up is the under 9 final, taking place in Nottingham on the 23rd April - we will keep you posted on how the Northants players do. Many congratulations to James Kearney, who recently took the title at this years Junior Squad Championships which were played in Reading. At the half way stage he was already in the lead by himself, and he held on till the end to finish as the under 16 champion. A report for all sections can be found here, and if full scores should become available we will update you with a link. Unfortunately the Northants under 11 team couldn't join the under 9 team, failing to qualify for their finals from their zonal match which took place in Twickenham, home of the Richmond team. After two rounds they were still in with a good chance, but sadly a poor last round meant they finished just one place out of qualification. All the scores from the day can be viewed in detail here, whilst results from the other zonals which took place on the same day can also be viewed here. April will see the Girls Team playing next, in their National Final taking place in Manchester, followed a week later by the under 9 team in their final in Nottingham. Good luck to all those playing in either event. Many congratulations to the whole of the Northants Under 9 team who played in the East Zonal competition, and finished in joint 5th position to qualify for the National Final next month. The Zonal took place down in Newham in East London, and every player played their part in the qualifying performance. The Final takes place in Nottingham in April, and all the players involved will be contacted with details of the day in due course. Again, well done to everybody! Next up is the zonal for the under 11 team, and so we wish them all the best as they travel down to Twickenham this coming Saturday - we will keep you informed as to how they do. The venue for this year's Junior Squad Championships appears to have now been finalised, and they are taking place near Reading in Berkshire. This tournament is NOT solely for current members of the squad, and indeed is one of the qualifying events to try and gain a place in the squad, so should you wish to enter and require an entry form you can download one here. The annual Midlands Chess Championships took place recently in Nottingham. This was an ideal chance for both our under 9 and under 11 teams to get in some match practice, and for the team managers to clarify board orders for both teams prior to the upcoming Under 9 zonal in East Ham and the under 11 zonal in Twickenham. In both instances the very strong Nottingham team came out on top, but Northants put up some fine performances which hopefully can be replicated in our attempts to qualify for this year's national finals approaching in April and May. In the Under 9 section Nottingham scored 28 points, to Northants 23.5. And in the Under 11 section Nottingham scored 38 points to Northants 27. Well done to all those involved in this match, and good luck to everybody for the zonals coming up very soon - we will keep you updated as to how the teams fair. This event takes place every year in Swindon, and is a qualifying event for the England Junior Chess Squad. This year three players travelled down from Northants, with Max Miller playing in the Under 12 Championships, where he scored 3.5 out of 6, whilst in the Major section Sam Herring scored 2.5 out of 5, and Owen Robinson 1.5 out of 5. You can find photographs and all the scores from all the sections by clicking on the following link here. 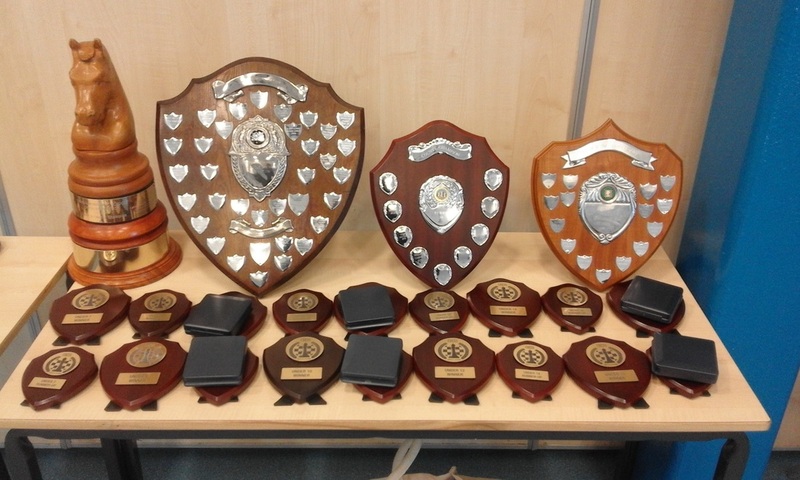 We now have all our County Champions after this seasons championships took place recently at Kingsthorpe Community College. This was a new venue for the NSCA, and we were looked after extremely well by all those involved from the college, and we would like to express our huge thanks to all those concerned for helping to make our tournament a huge success. You can see many of those players who came out victorious here, whilst all the scores from all the sections can be seen here. This of course was also the third part of this seasons NSCA Grand Prix, and with one tournament left to play almost every section is extremely tight with many players still in contention when it comes to this years SSAFA Tournament which takes place in June. The current top scorers in each section can be viewed here. Before that we have some county team matches, and the teams for the first of these, The Midlands Championships, has now been selected and the relevant players should be hearing from us over the next few days. A number of county junior players have started their New Year with some chess competitions a little further from home, with some taking part in the Nottingham Rapidplay Tournament, and others playing in the 22nd South Of England Junior Championships at Yateley Manor in Surrey. In the Under 16 closed James Kearney scored 2 out of 5, in the Under 13/15 Max Miller scored 3 out of 5 and Ben Cox scored 2. In the Under 11 section Toby Cox also scored 2 out of 5, whilst the Cox family completed their involvement with Lucian scoring 4 out of 6 in the under 8 section. In the Under 7 section Sarthak Sanyal also scored 4 out of 6. Well done to all 12 players. All the final scores from Nottingham can be found here, whilst those for the South Of England Championships can be found, via another webpage here. All the scores from our Christmas Congress can now be viewed here. This tournament was the second part in the NSCA Grand Prix, and the running totals for that will be updated shortly. Two more players made the trip down to London, to take part in the second half of the LJCC between Christmas and New Year. Milly Kotecha scored 4.5 out of 9 in the Under 12 Minor section, which in the Under 12 Major section Max Miller scored 4 out of 9. 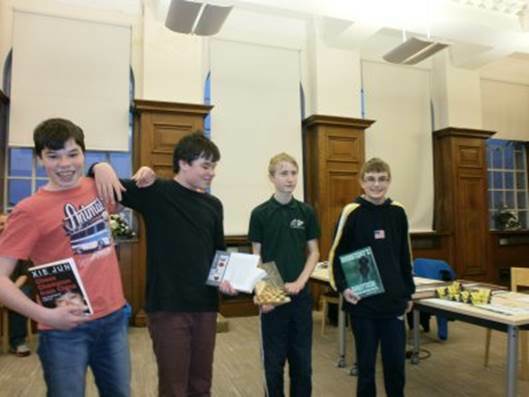 Well done to all the players who qualified and took part in the 2015 London Junior Chess Congress. You can find out the results from all the sections via their website here. A number of players from the county have recently been playing in tournaments in London. Over the first weekend of this year's London Junior Chess Championships the county was represented at both under 14 and under 10 levels. In the under 14 Minor section David Collyer finished joint 8th with a score of 4 out of 6, including a last round win against Peter Mottram-Epson, who along with his brother Alastair both finished on 3 out of 6. Also, Ben Raine scored 3.5, including a last round win against Bryony Marsh who finished with 2.5 points. Meanwhile, in the under 10 Major section, Krishna Srinivasan scored 3 out of 7. Cross tables for all these sections can be found via the LJCC website here. Well done to all these players, and good luck to anybody travelling down for the second weekend taking place between Christmas and New Year. Also playing in London recently was Sam Herring, who was taking part in two sections of the London Classic. First of all he played in the Weekend u2000 section, finishing on 3 out of 5 and in joint 11th place out of 71 players. He then took part in the Super Rapidplay, which comprised of a massive 368 entrants, including Grand Masters! Sam finished mid table in this, with a very respectable 4.5 out of 10. ​Full results for all sections at the Classic can be found via their website here. Three Northants players made the journey down to Shenley in Hertfordshire for a London Junior Chess Championships (LJCC) qualifying event. The Under 10 section was won outright by Krishna Srinivasan, scoring 5 out of 6. 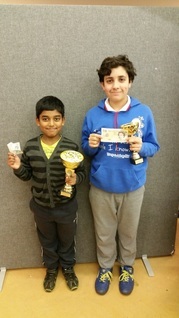 Meanwhile, in the under 12 section Max Miller was joint winner, again with 5 out of 6, and Vignesh Sudhakar scored a very creditable 2.5. Well done to all three players. ​Max and Krishna have now qualified for the Championships, which run during December. You can find out more about the LJCC via their website here, whilst there are still a few qualifying events that can be entered, details of which can be found here. After our first tournament of the season you may want to get organised and get your entry form in for our second - the 12th Northamptonshire Christmas Congress which takes place on Sunday 20th December. This will also form the second part of our Grand Prix, and will take place at a new venue for us, St Peter's Independent School in Northampton. You can download a form here. There was a great turn out for our first event of the season, despite the change of day to a Sunday, and also the change of venue. Many thanks to the head Kay Gerrett for allowing us to use Cedar Road Primary School on this occasion, and at such short notice. All the scores can be found here, and you can view photographs of some of those gaining awards here. Also, as in previous seasons, this event is used as a qualifier for the Junior County Teams, and those selected to join the squad will receive invites over the coming weeks. ​Also, this was again the first tournament in our season long NSCA Grand Prix, and the first leader board of the season can be found here. 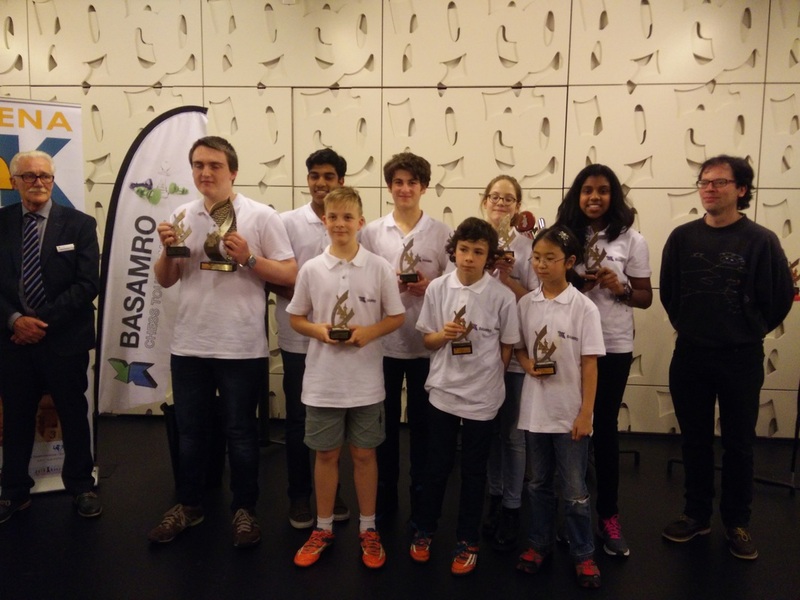 ​The British Rapidplay Chess Championships took place recently in Leeds, and a number of locally based players took part in the younger sections. In the Under 11 England Trial section Milly Kotecha scored well, finishing on 2.5 out of 5, whilst in the Sunday Junior section three local players all finished on 3 out of 5 - Ben Raine, Alastair Mottram-Epson, and Peter Mottram-Epson. ​Well done to all these players on some good performances. The full results from these and all the other sections can be found at the Championships website here. 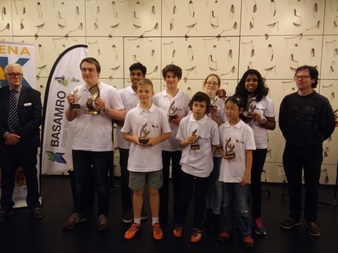 Northampton's Eva Ressel recently played as part of the National Junior Chess Squad at the Basamro Tournament in Rotterdam. This was a quadrangular between teams from Rotterdam, Murmansk, Paris and our National Squad. Although the English team were outclassed in terms of FIDE grading, Eva came home on 1/3 which matched the average result of the team. Her real success was in winning against the French opponent on a rating of 2069 to Eva's current grade of 1575! Many congratulations to Eva on this performance. The French however went on to win the event, and the full details of the tournament can be found on the official website here. Eva and the England National Junior Squad. 36th Northamptonshire Junior Congress - new date and venue! This will be our first tournament of the season, and as has now become usual it will also form the first part of this season's NSCA Grand Prix. ​It will also yet again act as a qualifying event to gain places in this year's county squads. However, due to unforeseen circumstances we have had to change the venue for this year, and have also had to move the event to a Sunday. ​So, please put in your diaries Sunday 15th November, at Cedar Road Primary School in Northampton, and you can download an entry form here. The dates for all of our "internal" competitions for the coming season have now been provisionally decided, and the calendar updated accordingly, so these, along with team training and matches, are now listed in the calendar. Our first tournament will be the Northamptonshire Junior Congress, which is due to take place on 14th November. The entry form for this will be available very soon. Meanwhile, if you are interested in trying to make the trial for the England Under 11 Team this season, the entry form for the first qualifying event is here, and all the relevant details can be found here.